Tie-dying cotton clothing is an activity that has been enjoyed for generations. Children and adults alike can enjoy creating colorful T-shirts, while no two designs are identical. 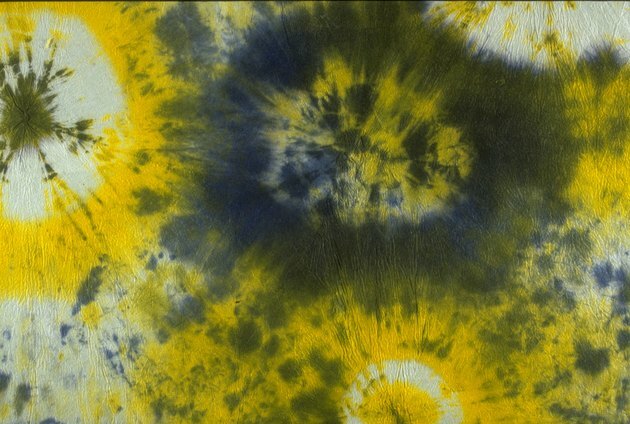 Tie-dyed materials must be set with care in order to preserve their design. Tie-dyed cotton can be set with vinegar for long lasting vibrancy and wear. Place the dyed cotton in a bucket. Pour white vinegar over top of the clothing, until the bucket is half way full. Fill the remainder of the bucket with cold water. Allow the garment to soak in the vinegar and water for 30 minutes. Remove the garment from the bucket. Place the garment in a washing machine alone. Add 1 cup of vinegar and ¼ cup of gentle laundry detergent to the wash cycle. Set the washing machine to the “delicate” setting and begin the wash. Remove the garment from the washing machine. Hang the garment to dry inside out on a clothing hanger.